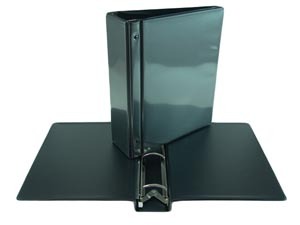 View 3 ring binders enjoy immense popularity. 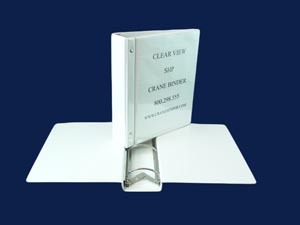 SHP view binder is light duty cased. Moderate cost. SHP is Crane Binder's trademarked name for the former swing hinge clone. The retro hybrid ring binder is available for immediate shipment in white or black, 3” or 2” capacity. Publish your book instantly. Clear View cover is open at top for your own print production to be inserted. Reusable. Take out old sheet replace with new. Small office color laser printers helped popularize the view binder. SHP Advanced hybrid ring binders give outstanding performance when compared with large capacity round ring or angle D ring types. Regular vinyl view binders ring mechanism actually create mechanical interference between the paper text and the view cover. The larger the "O" / "D" ring binder, the less efficient is its operation. SHP Eliminates binder problems by design. Hybrid design.